This is a USB On-the-Go adapter and it does exactly that, and more. It’s $3 from Amazon. Buy it here. If that’s too rich, you can solder one up in about ten minutes by following this Make Mag tutorial. I’m assuming you just impulse-bought it (or impulse-soldered it) after seeing that it was, in fact, $3. You might be wondering what it does. Allow me to explain. 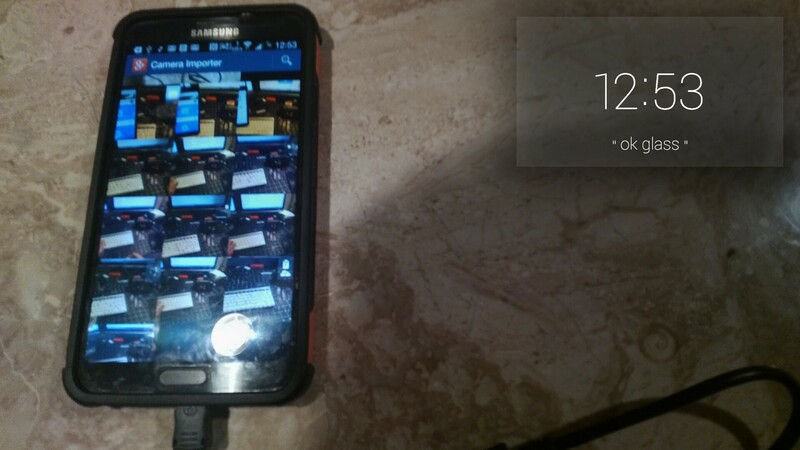 Usually, your phone/Glass is a USB client device. It waits to get plugged into something else, where it charges and answers requests from the host. The USB On-The-Go adapter you bought/hacked tells the device to reverse thrust and become a USB master – now, it makes requests from devices plugged into it, and it powers them. We’re going to abuse both of these. So let’s plug the USB OTG adapter into an Android phone*, plug a micro-USB cable into the adapter, and plug the cable into Glass. Holy cow! It’s charging! The adapter tells the phone to power the USB port, which charges Glass. Glass’ battery is about 350mAh, so my Note 3 can fully charge my Glass using about 10% of its juice. With the adapter and cable connected, open your Gallery or Photos app. You’ll be asked if it can access the USB device. Hit yes and the app will index Glass’ photos and videos. You can transfer, delete, or share them directly from the phone. They’re transferred over USB, not Bluetooth, so it’s much, much faster. Also, Glass is charging the whole time. Auto Backup is for amateurs. Yes, there’s more. Let’s try something really weird. 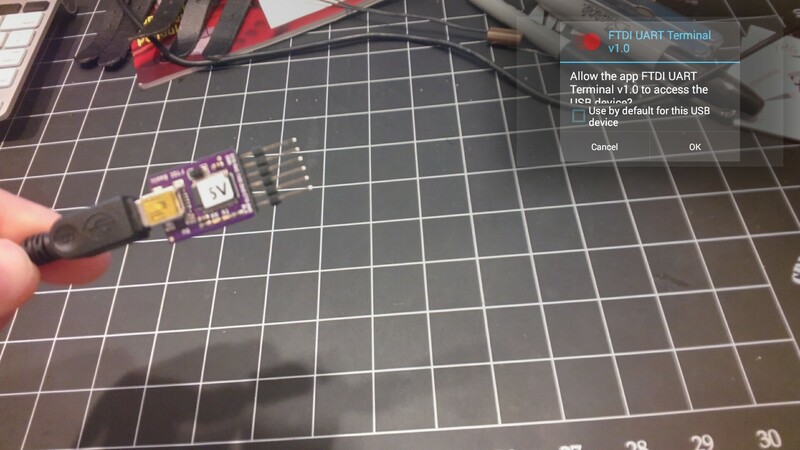 I’ve connected the USB OTG adapter to Glass, connected a mini-USB cable to the adapter, and plugged the cable into a SparkFun FTDI Basic. 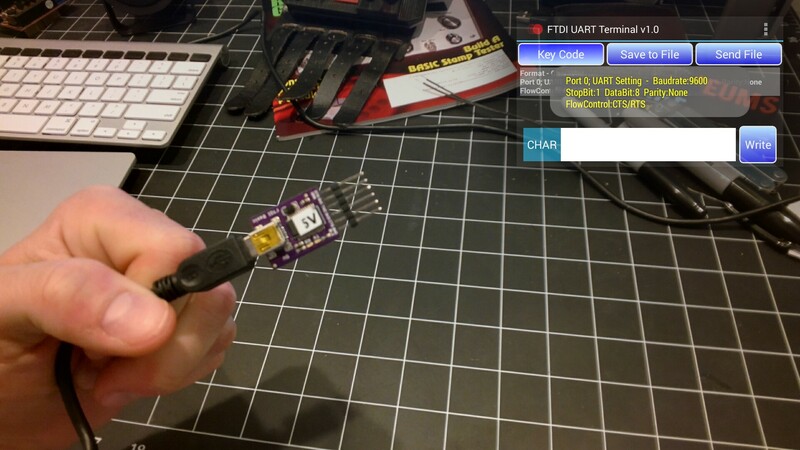 Then I sideloaded and launched the FTDI UART Terminal app. That’s right, hardware hackers, a serial terminal on Glass. You can’t really do much with the app, but FTDI has a nice library for their chips that can work with the GDK. With one of these connected, you can integrate your Glassware with Arduinos, sensors, and other cool stuff. Glass even powers the adapter, and any project powered by it. I doubt it can provide the full 500mA, but you never know. So for three bucks, you can use your phone as an external battery, manage your pics without waiting for them to sync, and connect weird USB devices to Glass. Sounds like a bargain to me. *iPhone users are SOL. No USB means no OTG. There are ways to tell a Lightning port to provide power, but they’re not nearly this easy. 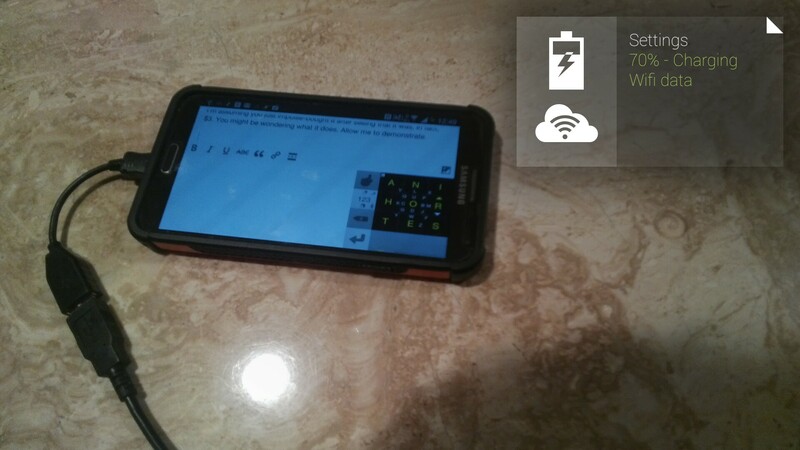 This entry was posted in Google Glass, Hardware Hacking, Swag by Yours Truly. Bookmark the permalink.